A little bit of WWII-era homefront propaganda, a little Omnivore's Dilemma, a bit of Tomorrowland plus some space Legos and I think you start to get the inspiration for "the Victory Garden of Tomorrow". 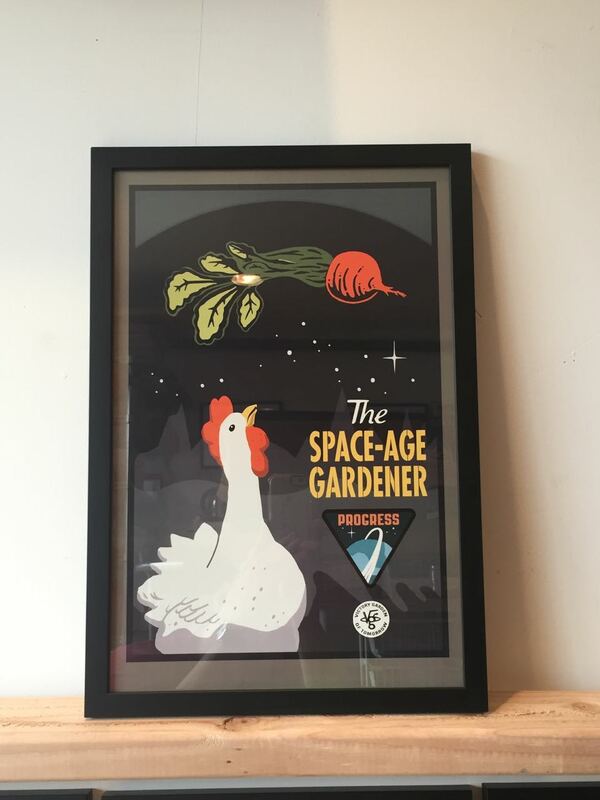 In my latest show, the "Victory Garden" goes to space where we can imagine having space gardens in an orbital farm, or chickens on a low-gravity moon base. Screaming Sky Gallery in Portland invited me to present a show of my work. They have this fun and adorable designer toy shop. So it made sense to make that the place to debut a new batch of designs. I've been wanting to expand the world in which my long sturdy "astro-gardener" has lived. This guy is one of the original ideas, and seems to have a following. So, I asked myself, what else goes on in his world? There has to be chickens, and a larger capsule garden. What about an orbital farm? And how did they get up there? And then, there's Earth Day, a very special holiday with a special story. The Earth Rise photograph by Apollo astronauts showed us how fragile and special is our home planet. It's like the "victory garden" went to space in these handful of designs. They were fun to make, and now they're available in the Design Shop under the Explorer Collection.